The Warrior Dash is not just a race or competition. It is a way to have fun, stay healthy, a reason to get fit, and challenge yourself by participating in an 3.25 mile obstacle course which takes place on the most rugged terrain around. Red Frog Events created the Warrior Dash in 2009 and has been presenting this obstacle course “battleground” all over the world ever since. The first race took place in Joliet, IL with 150 more races to follow across 6 countries. To date, over 1 million participants have tested their inner warrior and raised $7.5 million for St. Jude Children’s Hospital. 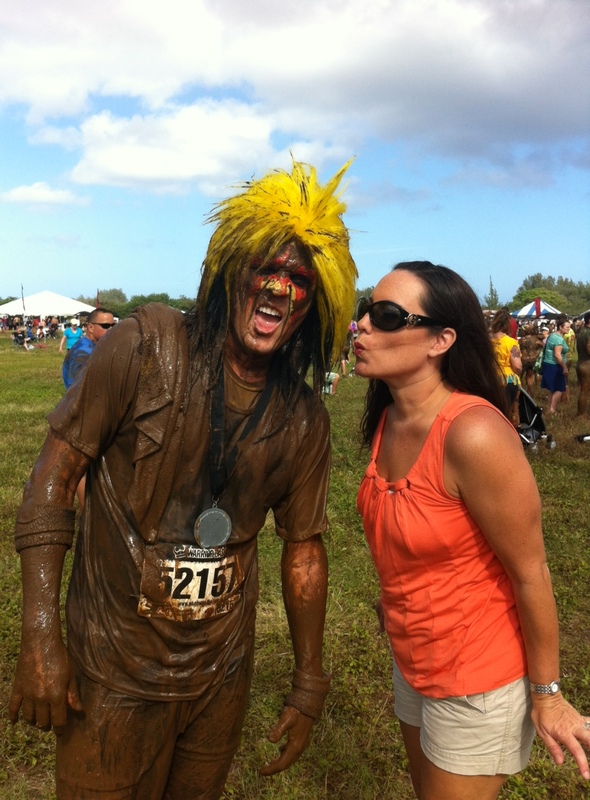 Warrior Dash Hawaii takes place at Dillingham Ranch on the North Shore of Oahu, located at 68-540 Farrington Highway. Compete in the race while skydivers parachute from above at Dillingham Ranch. Sign up, compete, get muddy, put on that viking helmet and earn that medal! Mud, sweat & beer…..
On March 24, 2012, more than 10,000 people participated in the Warrior Dash Hawaii to test their limits of strength, speed and stamina. 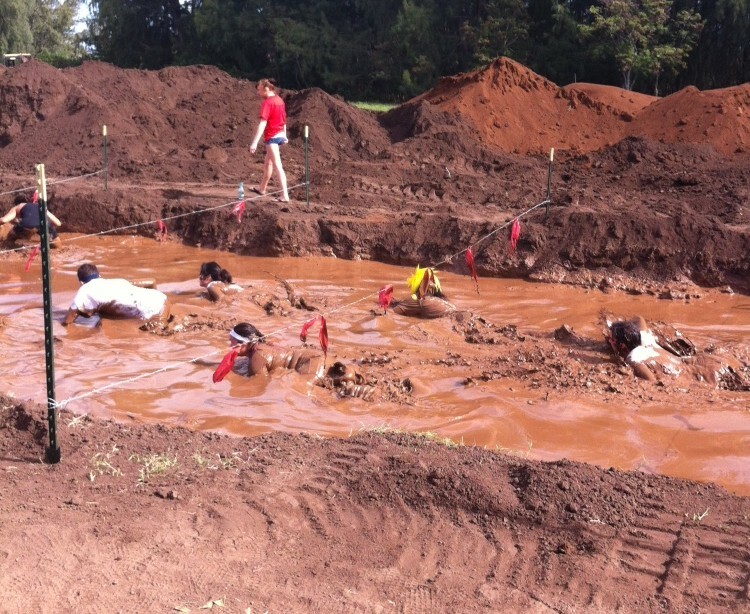 Some of the participants described their experience from the event as sore, swollen and tired, bloody, muddy and wired. The course itself has been described as “hellish conditions”. It is a very physical race and some people slip due to the rain and mud. Imagine climbing on and over obstacles in mud or sopping wet. 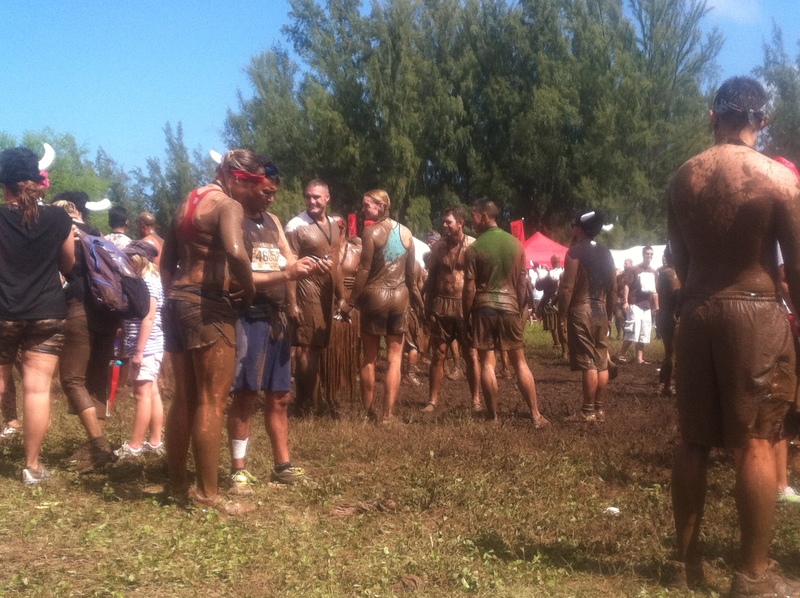 Some participants lose their clothes in the mud or from people climbing behind them and pulling on them. It can be challenging if you wear contacts, because you have to open your eyes to see but the mud can really irritate the contacts. 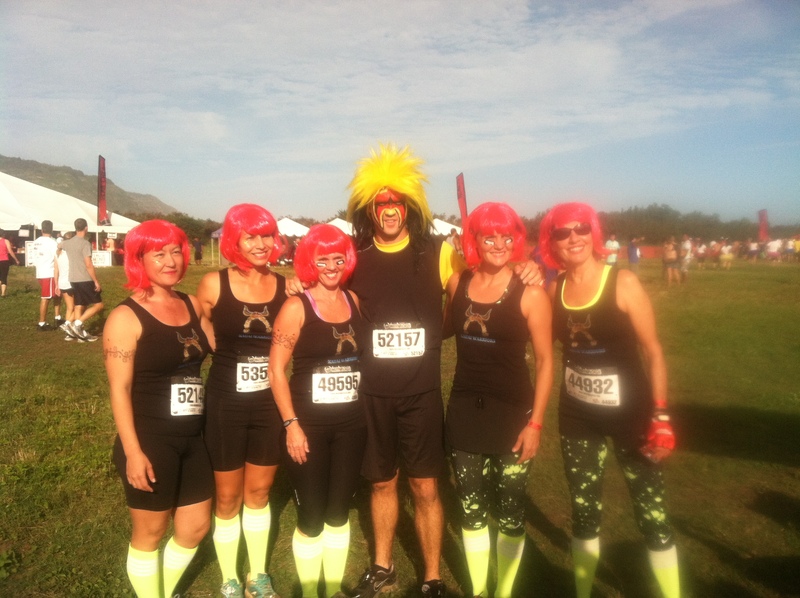 Thank g goodness for that crazy yellow and black Pittsburgh Steeler wig that my husband wore, so I could identify him throughout the race. You can see the wig as he crawls through the mud, pictured above. I also was able to spot him running through the fire. The wig was spotted through the clouds of smoke. There were really only two obstacles which can be viewed from the finish line lawn area. The race featured 13 treacherous obstacles! 10- 15-foot walls that each warrior had to climb, a pond with obstacles to climb over or swim under, an obstructive fire pit that had to be jumped and a pit of sweaty mud covered with barbed wire. As a spectator, I saw the mud pit refilled with water and dirt and then stirred throughout the day. It was soupy and sweaty after the thousands of people crawled through, some even bloody! For this reason, I would sign up for an early wave. Each person who registers is given a time in thirty minute intervals. Although, I saw people go through more than once. 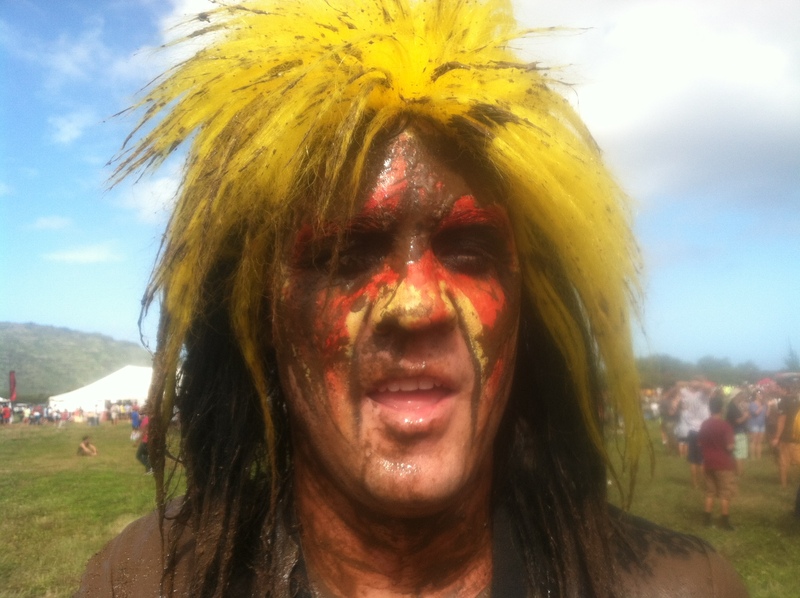 Warrior Dash Hawaii was so popular in 2012 that is has returned each year since! Many of those who enter the Dash never actually complete the course. Everyone was talking about the food. I would imagine that after the race, participants work up a healthy appetite! We had plans to take off to Cholo’s Homestyle Mexican & Margarita Bar in Haleiwa later that day. Apparently, that was everyone’s idea, as we saw Warriors everywhere there. The race itself didn’t have a ton of food options. The ever popular turkey leg was available as well as vegetarian food options. I would recommend bringing your own food in an ice chest and leaving it in your car. Gluten free food and beverages are available for purchase but not guaranteed at all events. Beer Time!!!! On a hot, dusty day on the North Shore of Oahu there isn’t anything that sounds more refreshing than a cold beer. Finishers are walking around everywhere, completely covered in mud holding a cold beer mug. You can purchase the large mug for $10.00 to take home as a souvenir (pictured on the right). If you don’t drink beer, be advised that it is the ONLY beverage for purchase. I would advise bringing an ice chest with your beverage of choice and leaving in your car for after the race. We also brought umbrellas, beach chairs, pastries and bottled water. I must say that we were more than prepared. We had planned to stay at the event most of the day to watch friends cross the finish line who had later start times. The most important item to bring – a plastic trash bag! We dumped all of the muddy clothes, shoes and socks into the plastic bag to wash later. This also helps keeps the rental car clean. Everything gets muddy. About 30 minutes after the first wave begins, the party begins!! Sit back and enjoy music, food, and beer while watching the finishers crawl from the muddy pit as they try to hang on to their clothes. The music was really loud and everyone just hung out and had fun. It is so much fun to watch people dragging through the mud at the finish line. I noticed many people had tight, spandex, clothing under their clothes in anticipation of losing their outter clothing. There were a lot of muddy butts at the finish! Watch people eat and drink at the “after party” before showering off. The whole field became one big muddy pit as the finishers drag their muddy shoes all over the lawn. Wear old shoes!! I would highly recommend bringing a change of clothes, shoes or flip flops, and a gallon of water in your car to shower off. 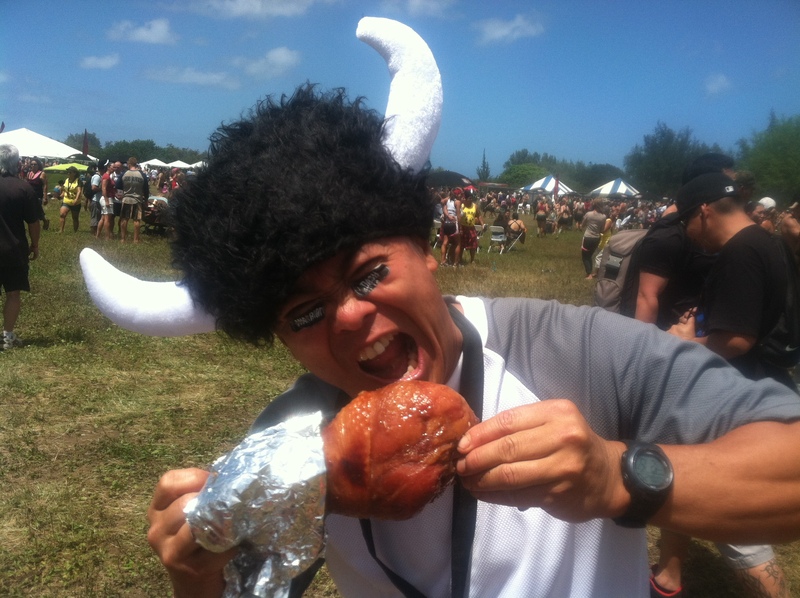 The first year, the Warrior Dash mentioned a water buffalo at the finish. No such luck! There was a shower if you wanted to pay $250 which would go to St. Jude Children’s Hospital. A great cause indeed, a little pricey for a shower, especially when you are paying for a hotel, rental car and flights just to get to the race! That left finishers one option – bathe in a nearby stream, which had cow dung piles all around. Gross! I would not encourage that, especially with open sores from the race. But everyone was doing it because that was all that was available. Did I say gross? Additional beer, clothing, merchandise and food are available for purchase at the race. The Warrior Dash website sells Warrior Gear. Choose from logo wear t-shirts, tank tops for women, shorts, sweatpants, zip up jackets and the infamous kilts! Kids sizes are available for t-shirts. You can also find accessories on their website which include bandannas, key chains, beer mugs, rubber wristbands, flip flops and more! Many participants just come in their own costumes or crazy clothing. I saw women in muumuu’s (Hawaiian traditional, long dress), Hooter’s T-Shirts, wigs, NFL jerseys, tutus, pajamas, Flintstones costumes, leg warmers and much more. Basically, anything goes! 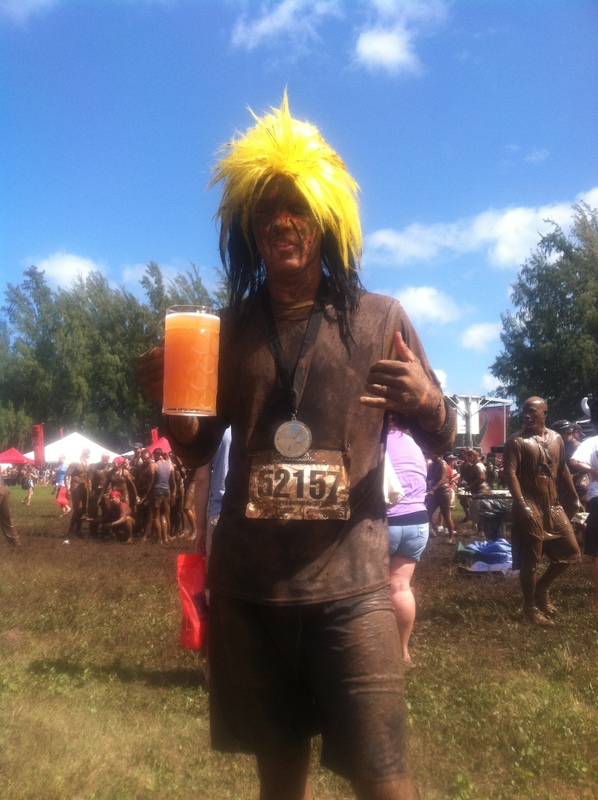 This entry was posted in Hawaii, Oahu, Hawaii, Travel Fit and tagged Cholo's Homestyle Mexican, Dillingham Ranch, Kauai Divas & Dudes, Pat Riley, Red Frog Events, St. Jude Children’s Hospital, Viking Helmet, Waialua, Warrior Dash, Warrior Dash Hawaii, water buffalo.